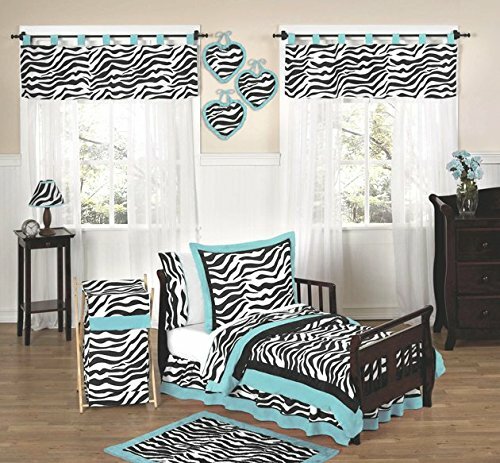 If your child is asking for a zebra bedroom makeover you will love the variety of colors available in the Funky Zebra Bedding Collection by JoJo Designs. 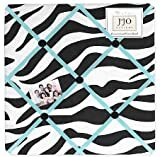 The Funky Zebra Bedding Collection by JoJo designs happens to one of my favorite children's bedding sets. This bedding collection is stunning with the Black and White Zebra Stripe Pattern and then a touch of 4 different color choice accents. The touch of color really makes this Zebra Bedding Pop and you can chose from Hot Pink, Purple,Turquoise and Lime Green. There is no age limit on this bedding either - this bedding would work for toddlers - young adults. Heck I would not even mind this on my own bed. The Zebra Bedding Sets are available in Toddler Size (made to fit Toddler Beds),Twin Size and Full/ Queen Size. JoJo Designs also makes a Funky Zebra Baby Bedding Collection as well - so you can get this same look for the babies crib. The Funky Zebra Bedding Sheets are sold separately and will match any of the color sets you chose. They are White Sheets with the edges having the Black and White Zebra Pattern. 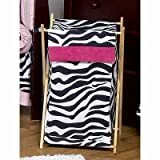 What do you think of this Zebra Bedding? JoJo Designs has also created a line of matching accessories to the Funky Zebra Collection. All of these are available in any of the color choices to match the bedding you choose. You can do a complete Zebra Room Makeover from just the items from JoJo Designs alone. Of course you can add in your own touches with Zebra Pattern items you find out there. It is so easy to match a Zebra Design and no lack of items available on the market to do it with. Maybe add in some other animal prints to have some fun like Giraffe Prints, Leopard Prints,Tiger Prints etc... Get your child involved with the shopping and have them add in their own touches to the room. Have fun with it !! Fun zebra designs! Very cool.